It's always a treat to getaway to Oahu. Much as I like to walk around Ala Moana Park as I did in the old days, I've traded this to walking at Ko Olina where the beaches are less crowded, especially on a weekday, and the scenery is enhanced by five peaceful lagoons. It's also a good place to enjoy the sunset. 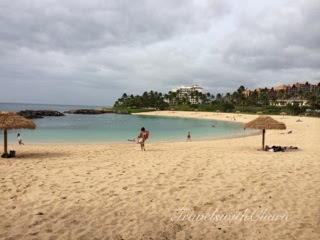 There are four inviting lagoons in Ko Olina, on the western shores of Oahu, about 30 minutes from Honolulu International Airport. If you prefer to be far away from the madding crowd, the Ko Olina resorts are an option. Each resort has its own private lagoon, which, even on the weekends is uncrowded. While first time visitors flock to Waikiki and locals congregate at Ala Moana Beach, Ko Olina remains off the radar screen except to those who belong to the Marriott Vacation Club. 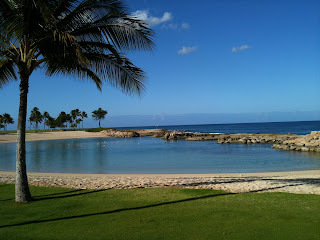 The Marriott Ihilani Ko Olina Resort and Spa and the Ko Olina Beach Club are open to non members. As of this writing, there is construction going on for more units which will surely impact the peace and quiet of this area. For now it is a great place for lazy days on the water, for energizing walks through all four lagoons, for rejuvenating mind and body, for watching the sunset, and for being grateful for yet another beautiful day in paradise.